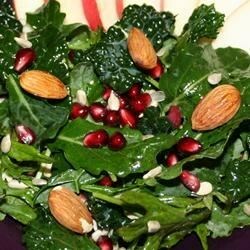 "A zesty combination of raw pomegranate and tender fresh kale makes a surprisingly great winter salad! By adding sliced or slivered almonds and sunflower seeds, you get a tasty crunch!" Wash and shake off extra water from the kale. Remove the center ribs and stems; discard. Chop the leaves until fine but still a little leafy. Combine the chopped kale, pomegranate seeds, sunflower seeds, and sliced almonds in a large bowl; toss to combine. Drizzle the rice vinegar, balsamic vinegar, and olive oil over the kale mixture while continuing to toss. Season with salt to serve. Some great add-in options are: Parmesan cheese, currants or raisins, dill, chopped bacon, diced Kalamata olives, chopped green onion, chives, cubed apple, lemon juice, or orange zest. Serves well by itself or with crackers, toasted pitas, sandwich wraps (in place of lettuce), or tuna salad. This is a great dish. Easy, simple and wonderful! I liked the textures and flavors, but the dressing to was too strong and too plentiful. I'll try it again with a more mellow, bottled dressing. Personally, instead of vinegar my family uses freshly squeezed lemons! So good! Poms. were not available in my local store, so I substitued fresh mozarella cheese diced. Only used 3 Tbs of each vinegar based on other reviews and mixed olive oil and grapesedd oil. Yummy! I thought kale would be bitter, but it isn't. Very fresh salad with a great texture and flavour. Very good if you are dieting.